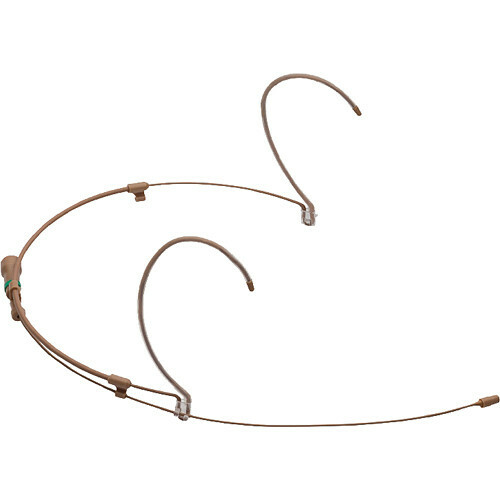 The beige H6 Omnidirectional Headset with Detachable Cable and LEMO 3-Pin Connector for Sennheiser Wireless Transmitters from Countryman is a low-profile headset microphone that combines the transparent sounding E6 Earset with a comfortable, lightweight, and adjustable headframe. Weighing less than one-tenth ounce, it can be used as a water- and wind-resistant mic for capturing audio in houses of worship, theater, and outdoor vocal and speech applications. This omnidirectional H6 Headset's cable terminates to a LEMO 3-pin connector for direct connection to a Sennheiser SK 50, SK 250, SK 3063, SK 5012, SK 5212, or SK 9000 wireless bodypack transmitter.